Goodreads says, "A breathtaking journey toward self-discovery and true love, from the author of If I Stay. When sheltered American good girl Allyson "LuLu" Healey first meets laid-back Dutch actor Willem De Ruiter at an underground performance of Twelfth Night in England, there’s an undeniable spark. After just one day together, that spark bursts into a flame, or so it seems to Allyson, until the following morning, when she wakes up after a whirlwind day in Paris to discover that Willem has left. Over the next year, Allyson embarks on a journey to come to terms with the narrow confines of her life, and through Shakespeare, travel, and a quest for her almost-true-love, to break free of those confines." Allyson Healey has always played by the rules. She did well in school, listened to her parents, hung out with her best friend, and did other extremely predictable things for a high schooler. She never really branched out or went on an adventure...that is until her trip abroad the summer before college. Her parents sent her and her best friend on a tour of Europe and Allyson was feeling pretty bored on this trip despite being in Europe. While in London, Allyson and her best friend watch an underground performance of Shakespeare's Twelfth Night and an actor from the play, Willem, catches her eye and they have a connection of some sort. This connection blossoms into an overnight adventure; Allyson breaks the rules and goes to Willem to Paris on this last night of her trip. She knows her parents would be furious and she knows it dangerous to go with someone she just met, but she wants to live a little. The whole day in Paris is magical, but the next day doesn't go as well. She can't find Willem anywhere. and consequently, she finds herself stranded in Paris and must get back to London in time to catch her flight home. Readers will follow Allyson after this heartbreaking day and all through her freshman year in college where she still can't shake the memories of her night in Paris with mysterious Willem. Gayle Forman's Just One Day is a heart-wrenching tale of first love, the freedom that travel brings, and the trials and tribulations of discovering what you want out of life. I will admit that I found Allyson to be taxing at times. She was tough to connect to, but I could appreciate her story nonetheless. That's why I adore Forman as an author, because readers can still find something to enjoy in her books, even if they don't relate to the characters. Once Allyson started to gain confidence, I found myself enjoying her more and more. Willem is such a great male lead. He's mysterious, talented, good looking, and adventurous. While he wasn't in the story very long, I found myself, along with Allyson, wondering about him long after he exited stage right. Just One Day is much more of a mystery than I thought it would be and I really liked that aspect of the book. Also, Just One Day is really about self-discovery. Allyson is at that age where she isn't sure who she is or what she wants out of life. She listens to her parents (too often! ), pretends to be someone she isn't, and lets her mother orchestrate her life - (her mother even tells her what classes to take at college!) Allyson has to break free from her parents and really put herself out there at college. Once she does, I found Just One Day to be unputdownable. While she is "finding herself," always in the back of her mind is Willem and while they only spent one day together, I couldn't let him go either. Just One Day has a lot of traveling in it, which is another aspect of this book that I enjoyed. You can learn so much about yourself and about the world when you travel. I loved reading about Allyson's adventures, which force her to leave her comfort zone. It reminded me a bit of Wanderlove and 13 Little Blue Envelopes. Lastly, Forman incorporates a lot of Shakespeare into Just One Day and being an English teacher, I loved that! It truly demonstrates how timeless Shakespeare is and how many years later, readers can still relate to his characters and the themes. One of my favorite parts of Just One Day is the Shakespeare class Allyson takes at college. Sign me up for that class! Just One Day didn't leave me a blubbering mess like If I Stay did and while it isn't as powerful, Just One Day is just as good, but in a different way. It's going down as one of my favorite reads of the year and after the ending of Just One Day, which left my heart beating out of my chest, I cannot wait for Just One Year. In sum, Forman has hit a home run once again. 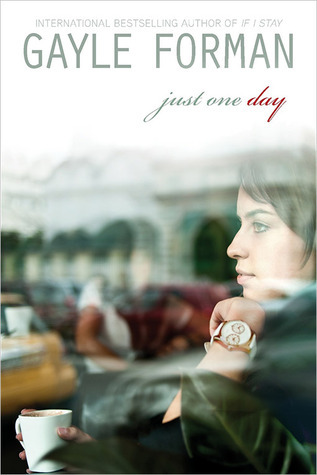 Want to win an ARC of Just One Day? Check out my giveaway! I haven't read If I Stay yet but this does sound really good. I like the travel aspect and I'm glad that Shakespeare plays a part too :) I will definitely be checking this out when it is published next year. Christina- you must read If I Stay! I hope you get to read this one in the new year as well. Thanks for dropping by! I pretty much agree with all that you said, even the comps for this book, but I'd also add The Statistical Probability of Love at First Sight. As a big fan of travel (I think that's how I first found your blog back in the day), I was especially drawn to those parts. I am dying to read Statistical Probability of Love at First Sight! Hopefully I can in the new year. Thanks for stopping by!